For fighter info, see Snake (SSBB) and Snake (SSBU). "Snake" redirects here. For other uses, see Snake (disambiguation). 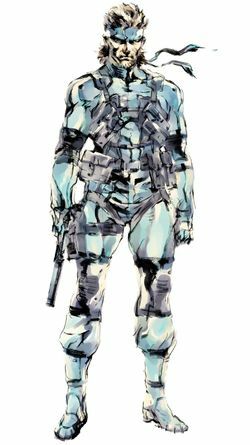 Official artwork of Solid Snake from Metal Gear Solid 2: Sons of Liberty. Solid Snake (ソリッド・スネーク, Solid Snake), also known simply as Snake and by his real name David, is the major protagonist of the Metal Gear series, created by Konami. Previously popularized as a character to serve as an antithesis to the cheery and colorful Nintendo-inspired characters that were prevalent in games near the end of the 1980s, Solid Snake became the first playable third-party character in the Super Smash Bros. series, appearing in the Nintendo fighting game, Super Smash Bros. Brawl and later, Super Smash Bros. Ultimate. Metal Gear franchise creator, Hideo Kojima, started off his franchise with the first Metal Gear for the MSX2 computer in 1987, as a pastiche of high-profile action movies at the time, such as Lethal Weapon and Escape from New York. Kojima's main character for the game, codenamed Solid Snake, was likewise inspired by the heroes from those action movies, such as Kyle Reese (played by Michael Biehn) from The Terminator, whom Snake's first portrait was based on. Snake's name, in fact, was derived from Escape from New York's main character, Snake Plissken (Kurt Russell). When Metal Gear was ported to the NES, it sold well enough that Snake subsequently appeared in the sequel, Metal Gear 2: Solid Snake. The character underwent an eight-year hiatus, until the release of the seminal Metal Gear Solid for Sony PlayStation in 1998, which fully established Solid Snake in his more popular, modern-day character design, which was made by artist, Yoji Shinkawa (see his above artwork). Shinkawa's Snake design features a dark grey bandanna, a consistent "sneaking suit", and the effective voicework of Akio Ohtsuka for Japanese versions and David Hayter for English versions of Metal Gear games as Snake's defining aspects. Metal Gear Solid proved to be a huge success, as it would skyrocket the stealth genre to popular heights in gaming, and the game and its sequels are considered to be among the greatest games of all time. In the Metal Gear series, the player assumes the role of Solid Snake (or a similar character depending on the game's scenario, like Raiden in most portions of Metal Gear Solid 2: Sons of Liberty or Naked Snake in Metal Gear Solid 3: Snake Eater) as a special-ops agent and spy, tasked to disarm and/or destroy what is usually a new incarnation of the eponymous, bipedal, mechanized, nuclear-based superweapon, Metal Gear. He must always act alone initially in each mission, sneaking and battling his way through enemy compounds, armed with nearly nothing other than his two-way "codec" radio to receive transmissions from his commanding officer and other characters, a pair of binoculars, and as a bonus touch, a pack of cigarettes. His wits must always be sharp for him to rely on as he carries out sabotage-based assignments that seem immensely stacked against him in concept, and he must acquire his own firearms and rations and make use of environmental elements, such as cardboard boxes (one of Snake's borderline-comical trademarks) to advance his various objectives. No mission Snake has ever gone through can be considered routine; each of his missions in the Metal Gear games is rife with all manner of epic drama, intrigue, double-crossings, betrayals, and revelations with wide-ranging implications for everything and everyone in the series. Snake's story begins with his father, codenamed Naked Snake, who operates for the original FOX unit found by Major Zero of the CIA at the height of the Cold War in Metal Gear Solid 3: Snake Eater. He is heavily influenced by his mission's revelations, where he finds out just how much he is a subject to the mechanisms of his government, so he splits away from the FOX unit and must deal with the revolt of his former FOX comrades in Metal Gear Solid: Portable Ops. Afterwards, Major Zero formed the Patriots, a group meant to unify the world by controlling information with Naked Snake, now accepting his title as Big Boss, as the group's figurehead; however, Zero feared Big Boss would leave the Patriots due to ideological differences between them. To insure the Patriots still have their icon in the event Big Boss leaves, Major Zero decides to initiate the Les Enfants Terribles project, which used DNA acquired from Big Boss to produce clones of him. From this project were born twins with one given the dominant genes of Big Boss (Eli, later codenamed Liquid Snake) and the other given the recessive genes (David, later codenamed Solid Snake). A third baby was also later born that was a perfect genetic copy of Big Boss, George Sears, later codenamed Solidus Snake. Big Boss learns of what Major Zero had done and leaves the Patriots. He then travels to Costa Rica and founds his own private military company, Militaires Sans Frontières. A year later, in Metal Gear Solid V: Ground Zeroes, Big Boss sneaks into a U.S prison camp in a attempted rescue mission. The rescue mission is successful, but it turns out that it was all a distraction, for as a strike team named XOF attacks Mother Base, and Big Boss is sent into a coma for 9 years. 9 years later, in Metal Gear Solid V: The Phantom Pain, it turns out that Big Boss has been replaced by a surviving combat medic that underwent surgery and psychological procedures to create a body double that not only looked liked him, but also thought he truly was the real Big Boss. Codenamed Venom Snake, he later finds out that he was a double created to trick the world, and that the real Big Boss is planning to create his own military country, Outer Heaven. In Metal Gear, the Western powers learn that Outer Heaven is in development of a weapon of mass destruction known as Metal Gear. FOXHOUND, founded by Big Boss years after the events of The Phantom Pain, is ordered by the U.S. government to infiltrate Outer Heaven and destroy its Metal Gear. In order to give Venom Snake more time to complete the Metal Gear, Big Boss comissions FOXHOUND's newest and least experienced member, Solid Snake, for the mission in hopes that he will fail. However, Solid Snake exceeded expectations and was able to not only infiltrate Outer Heaven, but single handledly destroy its Metal Gear, which activates a self destruct sequence of the base. While escaping the base Venom Snake confronts him as Big Boss (still maintaining his role as the real Big Boss's double), and reveals to him the true reason he was sent to Outer Heaven. The two then fight and Solid Snake kills him before narrowly escaping the base before destruction. After having his body double killed and Outer Heaven destroyed, Big Boss flees FOXHOUND and goes into hiding, later establishing Zanzibar Land in Central Asia. Roy Campbell takes Big Boss's place as commanding officer of FOXHOUND, and years later in Metal Gear 2: Solid Snake, Campbell assigns Snake to infiltrate a heavily fortified base in the nation, Zanzibar Land, which is also trying to become a nuclear power with the Metal Gear D model. Snake finds that the leading man behind this plot is Big Boss, and in a final confrontation with Metal Gear D, Snake defeats Big Boss with a makeshift flamethrower, and leaves him to die; however, Big Boss survives the battle despite the vast majority of his body severely burned. Both Solid Snake and Roy Campbell go into retirement after this. In Metal Gear Solid, Snake is called out of retirement from Alaska by Campbell, now working for the U.S. military, to battle FOXHOUND, which has now gone rogue and has seized the nuclear weapons facility at Shadow Moses Island, threatening the U.S. with a nuclear strike unless they acquire Big Boss' remains. Snake must infiltrate the island and defeat each rogue FOXHOUND member one-by-one, and he sabotages the Metal Gear REX model at Shadow Moses. Snake finds that the leading man behind this plot is an operative codenamed Liquid Snake, who is Solid Snake's genetic twin, and Solid Snake learns of his clone heritage. Solid survives while Liquid dies, and the mission is complete. Snake is called into service yet again in 2007 to infiltrate a tanker which gets sunk in Metal Gear Solid 2: Sons of Liberty's prologue sequence. It is during his infiltration of the tanker that he discovers that Liquid Snake "lived on" in Revolver Ocelot's recently transplanted arm (the arm that was transplanted was Liquid's), thus creating the character Liquid Ocelot. He survives and gets involved in the immensely intricate and complex scenarios that occur throughout the rest of the game in 2009. It is during these series of events that a third clone of Big Boss is revealed as Solidus Snake, who is a mixture of dominant and recessive genes, thus being considered a genetic bridge between the dominant Solid Snake and the recessive Liquid Snake. The PlayStation 3 game, Metal Gear Solid 4: Guns of the Patriots, features an aged Snake, now identified as Old Snake by the game. Advanced cellular degeneration caused by the cloning process used to create him has aged him prematurely. In the game, he wears a sneaking suit outfitted with "Octocamo" technology, which allows him to blend with his environment, as well as a face mask which alters his appearance (allowing the player to use his younger look during gameplay as well and disguise Snake as other characters). This new character design is based upon actor Lee Van Cleef. In the game, Old Snake, on his last mission, must settle the score with Liquid Ocelot as the latter attempts to launch a rebellion against the Patriots' AI systems, which would cause catastrophic consequences for the world. According to Ryan Payton of Konami, Guns of the Patriots will be the final canonical Metal Gear game to feature Solid Snake as the main character. It was also the canonical last game in the Metal Gear franchise, until Metal Gear Rising: Revengeance. Kojima himself has stated that the series will continue, but does not want the character to be handled by anyone else. Solid Snake, in his less-aged incarnation, has made many non-canonical game appearances, perhaps even more times than in canonical Metal Gear games. In addition to several supplemental and enhanced titles that have accompanied the "main" games (including bonus skateboarding segments for Snake to partake in), Snake has appeared in several alternate reality Metal Gear games, including a Game Boy Color Metal Gear Solid (officially titled Metal Gear: Ghost Babel in Japan), and in the card-based Metal Gear Ac!d series for PSP. 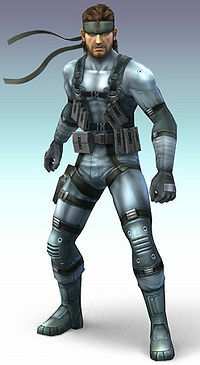 Solid Snake has also appeared as a playable character in two fighting games involving characters from other franchises. The first is Hudson Soft's DreamMix TV World Fighters, involving characters from Konami, Hudson Soft (which was not yet a Konami subsidiary at the time) and toy maker Takara Tomy such as Bomberman, and Optimus Prime and Megatron from the Transformers franchise. The second is the Wii fighting game, Super Smash Bros. Brawl, alongside famous Nintendo characters such as Mario and Pikachu. His inclusion in the game generated an immense outburst across the game industry. Metal Gear Solid is also parodied in Ape Escape 3 for the PS2 in the minigame Mesal Gear Solid: Snake Escape, where Solid Snake has been captured and the player must control a monkey to rescue him. During development of the Super Smash Bros. Melee, Metal Gear series creator Hideo Kojima wanted Masahiro Sakurai to include Snake in the game as a playable fighter; however, the addition was not viable because development of Melee was too far in. Indeed, Snake was not included as a playable character when Melee came out, but he was the first of two third-party characters confirmed for Brawl. Snake as he appears in Brawl. Snake makes his debut in the Smash series as a playable character in Brawl, announced via a surprise teaser shown after the first trailer for the game. Snake's appearance in the Smash series was unusual; prior to the announcement, no third-party characters had ever appeared in a Smash game. Kojima asked Sakurai himself to add Snake; as the two were personal friends, Snake was added to the expanding roster of characters. His appearance is based on his design from Metal Gear Solid 2: Sons of Liberty. Attempting to recreate Snake's tactical method of fighting utilizing cunning and modern warfare in the Metal Gear games themselves, Snake enters the fray as a predominantly defensive strategic character with a high emphasis on set-ups and controlling the fight. Much of Snake's moves utilize firepower of some sort; in fact, all three of Snake's smash attacks use some sort of weapon rather than a hand to hand move, relegating his actual CQC (Close Quarters Combat) moves to his tilt moves and aerials. Further more, two out of three of these smash attacks are indirect in nature. Combined with his special moves of similar nature, such as planting a remote detonated C4 mine, and the deceptively high power of his hand to hand moves, Snake is perhaps one of the most unique characters in the game with his high emphasis on tactical fighting. Snake is also one of the heavier characters in the game in both speed and durability, although his impressive recovery ability thanks to his Cypher move and his fast tumble roll dash move can make him deceptively quick when the need arises. Although Snake uses a large amount of explosive firepower, he has no traditional firearms, such as handguns and rifles, despite regularly making use of them in the Metal Gear games themselves. This is presumably due to Super Smash Bros. Brawl's emphasis on being friendly to almost all age groups, and thus the use of common guns would possibly raise the rating of the game. As is, many of Snake's current moves do have a real world counterpart, such as traditional Hand Grenades and the R.P.G. However, these are treated in a bit more of a comical and lighthearted fashion. Snake's character brings a high amount of Easter eggs and homages to his game series with him, from saying "Tasty" when eating food akin to Metal Gear Solid 3: Snake Eater, to his down throw, resembling the sleeper/neck breaker hold featured in all the Metal Gear Solid games to date, among other things. His rather unorthodox stealth tactic of hiding within a cardboard box also makes an appearance as Snake's taunt. Like Luigi's "kick" taunt, the cardboard box can deal damage. All of his taunts make Snake wear the cardboard box, but he uses a different way of putting it on for each of his three taunts. Snake can also call one of his affiliates via the Codec, much like in the Metal Gear games, as a secret taunt, only possible on the Shadow Moses Island stage. Each character, including Snake himself (if two or more players are using him), has a distinct conversation and the original voice actors for Solid Snake, Colonel Roy Campbell, Hal "Otacon" Emmerich, and Mei Ling reprise their roles. There's even one instance of Slippy Toad appearing within the Codec while talking about Falco. Because of his unique gameplay and overwhelming tournament dominance, Snake currently ranks 6th on the official tier list. This is often disputed due to his very successful results in tournaments as many argue that he is among the best characters in the game. His Smash appearance has also garnered criticism from casual and professional Smashers, as he has been dubbed one of the two most overpowered characters in the game (again, along with Meta Knight) mainly due to his fast, disjointed and powerful attacks which possess hitboxes that extend much further than the actual animation. Snake is also known as the Brawl equivalent of Fox's Melee incarnation, as he is known to have one of the highest learning curves due to his highly sophisticated playstyle and the fact that players must be aware of aspects such as knowing the right place to lay his explosives and making sure that he does not harm himself and, in the worst case scenario, committing suicide in the process. A former member of FOXHOUND with an IQ of 180 and mastery of six languages. He's an infiltration specialist whose ability to carry out missions under any conditions has made him a legend. He's saved the world three times from the threat of bipedal, nuclear-armed mechs called Metal Gear. Currently he's working with the anti-Metal Gear group known as Philanthropy. A SEAL member who infiltrates the Big Shell to suppress a terrorist group threatening to destroy it. He joins forces with Raiden, a new recruit in the special-forces unit called FOXHOUND. Disguised in order to secretly infiltrate the Big Shell, Pliskin is actually Solid Snake. When Kojima was asked about the possibility of Snake reappearing in SSB4 during an interview in March 2014, he replied: "I'm not working on that game, but I don't think it's likely [that Snake will return]. If Mr. Sakurai is watching this, hopefully we see Snake." Snake, along with the entire Metal Gear universe, was cut in SSB4. In addition, Snake is the only cut character from Brawl who does not have a trophy in SSB4. Snake was also mentioned during the 50 Fact Extravaganza when Palutena's Guidance was being compared to the Codec Conversations. Snake, as he appears in Super Smash Bros. Ultimate. Snake returns as an unlockable playable character in Super Smash Bros. Ultimate, after a decade-long absence. His moveset has been primarily unchanged, though he benefits most from the universal frame-3 jumpsquat and from the universal changes to the game’s speed and mobility options. David Hayter and Akio Otsuka’s voice clips from Brawl have been recycled, including those for the accompanying Codec conversations. Hayter initially confirmed his reprisal on Twitter after being asked if his voice clips were repurposed. Naked Snake during the Cold War. His beard is a full beard, which resembles Naked Snake's beard more than Solid Snake's stubble. Several of his alternate costumes feature camouflage exclusive to Metal Gear Solid 3. His C4 is sometimes shaped like a butterfly, which is another reference to Metal Gear Solid 3. In spite of the similarities, Brawl specifically identifies the playable Snake as being Solid Snake in official materials. His codec support team, consisting of Metal Gear Solid cast members Otacon, Mei Ling, and Colonel Roy Campbell, also makes references to various characters and events directly pertaining to Solid Snake's appearances in the series. Brawl is the second time Solid Snake and Yoshi have appeared in the same game; the first being when a Yoshi doll appears in The Twin Snakes in Otacon's lab. Yoshi would later appear in the 3DS port of Metal Gear Solid 3 wherein Yoshi dolls replace the Kerotan frog banks dotted around the game's areas. Additionally, Ultimate is the third time Solid Snake, Simon Belmont and Bomberman have appeared in the same game; the first two being DreamMix TV World Fighters and Super Bomberman R.
Ultimate also marks the second time a Metal Gear character can fight Rathalos as monsters from the Monster Hunter series appeared once as bosses on extra missions in Metal Gear Solid: Peace Walker. The Ice Climbers and Snake are the only characters from single playable character universes to not return in SSB4. Snake is also the only Brawl veteran to not appear in SSB4 as a trophy. Snake and Young Link are the only cut characters unavailable as a trophy in either version on SSB4. Snake is the only third-party character to have been cut from an installment. Snake is the first playable character to have appeared in at least one game with an M-rating to be featured in a Super Smash Bros. game, later being joined by Bayonetta, Simon, and Joker. Snake is one of three fighters to use an alias and not a form of their real name, the others being Bayonetta and Joker. Coincidentally, Snake's real first name is the same as his English voice actor's, David Hayter. Snake is the only third-party character to be absent in an installment after his debut. Snake is the only third-party character to have his Final Smash changed between games. 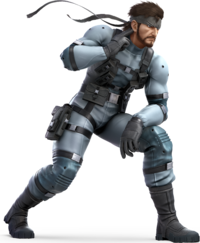 Snake is the only third-party character to appear in more than one game in the series to have always been an unlockable character. Snake is the only character to have their series logo change entirely. Snake is the only playable character in the series to have made his debut on a home computer. Snake, Luigi, Wario, Corrin and Yoshi are the only fighters to feature material from upcoming games in Smash - Shadow Moses Island in Brawl featured the Gekkos and main theme from Metal Gear Solid 4: Guns of the Patriots, which. at the time of Brawl's release, was unreleased. This does not count Roy, who debuted in Melee before his own game was released. Snake is currently the only third-party character that doesn’t have a movie or TV show based on his series. This page was last edited on April 12, 2019, at 11:29.